Once again the wall street Journal misses the mark by trying to explain long-term changes with facts out of context, with yet another short-term graph. 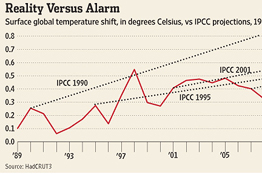 RealClimate has posted a breakdown of the issues misconstrued as outlined by Barry Bickmore. The Wall Street Journal posted yet another op-ed by 16 scientists and engineers, which even include a few climate scientists(!!!). Here is the editor’s note to explain the context. Editor’s Note: The authors of the following letter, listed below, are also the signatories of“No Need to Panic About Global Warming,” an op-ed that appeared in the Journal on January 27. This letter responds to criticisms of the op-ed made by Kevin Trenberth and 37 others in a letter published Feb. 1, and by Robert Byer of the American Physical Society in a letter published Feb. 6. The reality seems to still be that arguments and facts out of context continue to cloud the judgement and rational capacity of those that can't quite get in the right conversation about how science really works. Personal bias often precludes degrees of rationality when the argument itself increases cognitive dissonance.